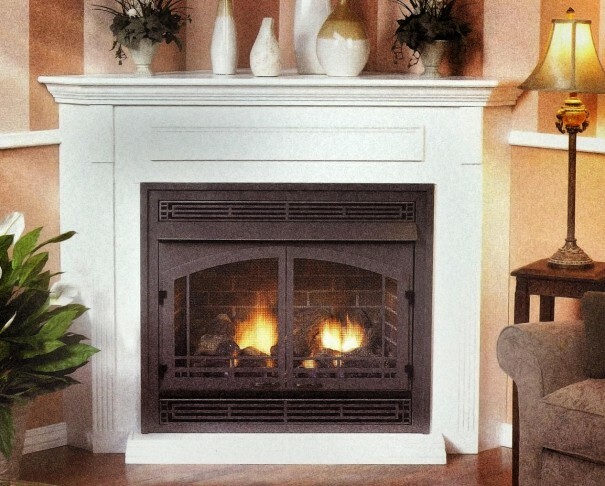 The Vail Vent Free Fireplace is a packaged deal that will provide its owner the ability to install a complete vent free fireplace in a new home build or room addition. The fireplaces are zero clearance certified and they come with an integrated oxygen depletion sensor. Available in several sizes, 24", 26" with mantel Combo, 26", 32", and 36". The Vail units come with the choice of two vent free log sets, a 5-piece Ceramic Fiber Log Set or the 6-piece Sassafras Log Set. Manual and remote options available, including millivolt, thermostat and intermittent pilot. Decorative louvres, doors and frames are available on the 32" and 36" models. Standard cabinet and corner mantels are also available in 7 different frame finishes. Fuel options include natural gas and propane.